The Internet Mastery Platinum Program – The Unique MasterMind Experience that holds you by the hand for 12months providing you with EVERYTHING you need to know to Unleash Exponential Growth and Profitability in your Internet Business or Online Sales Channel, by Mastering Cutting-Edge Traffic Lead Generation, Conversion and Client Management Strategies with an Unheard-of-Money-Back Result Guarantee of a minimum 100% Return on your Program Investment. You will have Exponential Programs’ most successful Internet marketing experts working with you on your business for the next twelve months, using the most advanced, developed and proven online strategies by top Internet experts. Get established with a cash-generating Internet business to earn extra income. Massively leverage your existing Internet business or online channel with Internet specific exponential growth strategies. Extract yourself from the day-to-day running of your online business as you enjoy the passive income and look for new opportunities. Remove the technical, strategic or marketing challenges that are putting the brakes on your online business. Sell your Internet business as a going concern for multiples of your annual revenue. Learn how to buy, optimise and sell websites and bank capital gains – in as little as 30 days. Kick start your journey to online PROFITS and you’ll be REAPING the REWARDS this year. If you've ever wanted to create a lavish income online - one that pays you $100,000 or more per year, with as little or as much direct involvement as you like. The term Virtual Real Estate may be new to you, but it simply means the buying, optimising and selling of established websites that are ALREADY MAKING MONEY. And what's more... you can start small with as little as $2,000 "seed capital" and use the optimisation strategies detailed in the Virtual Real Estate Empire Building Workshop to boost your cashflow and parlay your profits into more web properties. Then it's just rinse and repeat... rinse and repeat... until you acquire the number of websites that spit out the income you desire. Virtual Real Estate is a business model that rewards a different skill set than other models such as niche information product marketing. By buying established web businesses, you eliminate the expensive and time-consuming process of identifying and testing potential niches. Many established websites can be purchased for as little 12 months’ revenue - an extremely low multiple compared with “offline” businesses. The cost of entry is low. Many established websites are available for purchase in the US$500 – US$5,000 range. Most existing online businesses are so poorly optimised that you can increase cashflow and asset value quickly and easily by applying a set of proven web optimisation techniques and strategies which you will learn at the Virtual Real Estate Empire Building Workshop. What are the keys to success with Virtual Real Estate? Trading: identifying opportunities, conducting due diligence, buying and selling websites. Optimising web properties is actually very straightforward when you apply the step-by-step traffic generation and traffic monetization strategies you learn during the Virtual Real Estate Empire Building Workshop. Click here to read more about the Virtual Real Estate Empire Building Workshop. This one-day follow-on event builds on the skills and techniques taught at the Virtual Real Estate Empire Building Workshop. It is designed for Platinum Members and up to 10 non-Platinum attendees who are committed to generating $3,000 to $7,000 per month from their portfolio of websites. This, once again is NOT a public event. The strategies, techniques and tips revealed during this one day session can literally be applied and generate an on-going $100,000/year passive income stream that runs practically on auto-pilot. The pre-requisite to attend this event is the Virtual Real Estate Empire Building Workshop or Business/Internet Platinum Membership. Click here to read more about the Advanced Virtual Real Estate event. Even if you’re an Internet Mastery Platinum Member, you can attend this event because your Internet Empire is in fact --- a business! In this remarkable, power-house, Business, Marketing and Personal Mastery event, we will teach you the mind-blowing business secrets which have helped some of our clients create more than $20 million in revenue and capital gain value for themselves and their partners EVERY YEAR. These strategies are designed to work for home-based business operators, right through to large multi-national companies on how to massively propel their profit earnings through a unique ‘scientific’ approach to sales and marketing. You will see how you too can start the right business, in the right industry, from scratch, with absolutely no money, and in less than 90 days create profits of $3,000 to $5,000 per week. It makes no difference if you are currently an employee or you’re running your own company, these revolutionary marketing techniques will help you generate up to 10 times the profit and income you are currently earning in less than 2 years. Day One is focused on your role as Sales and Marketing Director. Day Two concentrates your responsibility as the Human Resource and Personal Development Director. Day Three is entirely dedicated to systemisation and the technical components of the business, you as the Chief Technology, Information and Finance Director. Day Four has you,the Entrepreneur Owner/Operator as the main actor – your responsibility as Managing Director, the steward of the ship. Click here to read more about the Advanced Business Mastery event. Ready, Set, GO for 3 power-packed days filled with strategies, tools and programs designed to catapult your business from ‘now’ to ‘beyond belief’! Working with Australia’s Number 1 Exponential Growth Strategist, Dr Marc Dussault, you’ll learn in exacting, specific, no-holds-barred terms precisely what you need to do to achieve the business results that until now you’ve only dreamed of. And when we say ‘working’ we mean it because each day of this boot camp is 12 hours of solid participation in your future. There’ll be case studies, quick-fire Q & A sessions with Dr Dussault and several strategies covered that have never been revealed before in Australia. You’ll discover the secrets of the Exponential Mindset and share all the ‘Aha’ moments with the entrepreneur in the Hot Seat. And by the end of these 3 days your life and experience as an entrepreneur will be totally transformed. Click here to read more about the Exponential Internet and Business Building Bootcamp. MANY online businesses and business websites fail because their business model is ineffective, inefficient, sub-optimised, or just WRONG. During this workshop you’ll learn to select from a wide range of business models, each	designed to achieve a different outcome. You’ll then determine how to structure your web-based business model to create one or more new, self-supporting Rivers of Revenue™. If you have an existing online business, you’ll refine your current business model to deliver MORE value, REDUCE your costs and DECREASE your workload. You’ll also discover how to set up the right systems, tools and processes to automate and streamline your online business. WITHOUT the right information at your fingertips, developing and improving your online results is like flying blind. We’ll show you what to track, how to track it as well as precise ways to turn this information into profits using live examples that you can watch unfold in real time. With the right information, you’ll be powerfully precise and devastatingly effective with every tweak you make. You’ll have the certainty you need to grow your profits rapidly in the least possible time by modifying what will have the greatest influence on results. ONE of the biggest challenges of running a business is finding quality providers and ensuring they deliver the results you need. An online business is no different. We’ll show you how to leverage KEY resources that you don’t have to hire in-house to create the sales and support systems you need to grow your online sales exponentially while you focus only on “highest and best use” activities. Instead of creating systems from scratch – we’ll give you a wide range of ready-made, pre-tested systems and processes to select from. Why try to reinvent the wheel? You need to have a CRM package at the foundation of your online Parthenon Empire to store your suspect, prospect and client files, activities and purchases. Even though we are avid advocates of Salesforce. com and will use it as the example, you can choose your own CRM as we will be explaining the principles involved that ANY CRM must have to fully support a Parthenon approach to Online Marketing. We’ll show you how to set up Google Adwords campaigns that outperform your competitors. You’ll learn advanced Google Adwords strategies to lower your click cost and explode your conversion rates, filling your sales funnel with hundreds or thousands of laser-targeted visitors every month. Best of all, you’ll see how easy it is with the cheat sheets and checklists we give you. You’ll be able to eliminate the costly trial and error process and ramp up your sales and customer acquisition at blistering speeds. We’ll reveal how one website can outperform another website by 500% when they’re selling exactly the same product! This workshop will delve into the specific website conversion secrets that you can use to ramp up your website to convert MORE visitors into clients INSTANTLY. You’ll be shown how to dramatically boost your opt-ins, shopping-cart sales and minimise abandonment, all absolutely crucial to squeezing maximum profits from your website. Killer copywriting will be covered in a separate stand alone 1-day bonus workshop. Building a big database is one of the key Parthenon Pillars to a profitable website. We’ll show you how to build bigger lists and manage them easily with ready-made tools. You’ll learn how to employ viral marketing techniques to magnify your reach and effectiveness. And to top it off, you’ll learn how to adapt online host-beneficiary and joint-venture strategies to produce lucrative and limitless possibilities, one click at time. Many online business owners spend months trying to work out the secrets of search-engine optimisation (SEO). Get ready to cut to the chase and have proven SEO strategies revealed that work immediately! You’ll learn advanced strategies for generating free site traffic to feed MORE visitors to your website(s). You’ll also learn how to systemise and outsource your SEO strategy and engage low-cost contractors to implement them for you. Everyone’s heard about social networking, blogs and Web 2.0 but HOW do you convert these tools into profit generators for your website? We’ll show you which powerful Web 2.0 strategies will work to build your pre-eminence and attract and monetise more traffic. Some of these strategies are not appropriate for your product or service. Knowing this upfront can save you countless hours of wasted effort! By this workshop, you’ll have a massively profitable online business. THIS will be the workshop you have been waiting for. We’ll show you how to remove yourself from the process of running your online business so you can enjoy on-going passive income and freedom. If you’re ready to ‘cash-out’, We’ll show you how to sell your online business for between 2 to 10 times annual earnings so you can either move on to create your next online success story or enjoy your new-found capital gain. We call these Cash Flow or Cash Grow Strategies. Each month, you will receive one 1-hour recording of a MasterMind Session that covered an Exponential Marketing topic in-depth, drilling down into the KEY distinctions that make all the difference. You�ll hear first-hand some of the breakthroughs people experienced in REAL TIME as they uncover hidden opportunities in their business or website that until that moment lay right there under their nose, just ready to be picked up and leveraged. Topics will change and be updated on an on-going basis with the latest, most pertinent topics and ground-breaking sessions that will be cherry-picked for you. The titles below are just a sub-sample of some of the conference calls that have taken place. MULTIPLE strategies for creating an information product for less than $500 in less than a week! The top Internet Marketing Business Models are reviewed, analysed and evaluated to minimise cost and maximum results � including profits, opt-ins and subscriptions. Finally! How to Make Money Online in Less than 30 days! How to AVOID making a $100,000 blunder in three easy steps � start by making it easy for people to buy from you online. The 7 TOP Secrets to creating Killer Web Content that will have prospects pounding down your door, begging you to take their money! Massively Magnify your Pathways to Profits™ using Host-Beneficiary Partnerships. What to do once you've bought a website and want to start to improve it � a step-by-step checklist review. Master this Exponential Mindset™ strategy to cut your marketing costs by as much as 50% while doubling or tripling your response rates. How to Create Killer Headlines to Triple or Quadruple Your Response Rates. Creating an information product to produce an endless stream of QUALIFIED suspects and prospects that flows into your sales funnel. Learning how to integrate multiple information products into your Pathways To Profits™ to cut your sales cycle in half, reduce your delivery costs by as much as 40% WHILE turning clients into raving fans. Kountless Kaleisdoscopic Kombinations™ that you can use when you Twist the Kube™ of possibilities that are revealed in this incredible session that will have your head spinning faster than a Rubik�s Cube in a Master Solver�s hands at a World Record Rubik�s Cube™ convention! Yes, that’s right. We’ll trash and destroy what you’re currently doing on the Internet and re-build an exponential strategy that will have your website humming like a well tuned turbo-charged money making engine. During the one-hour consultation, we’ll evaluate and assess everything your doing from lead generation to product fulfilment, compressing your Pathways To Profits™ and maximising your Management By Metrics™ to ensure you squeeze every single drop of profit you can from your online investments such as Google Adwords. We cover so many different perspectives and strategies, you’ll be glad we recorded it so you can download and listen to it over and over again to make sure you follow the step-by-step instructions we’ve given you AND fully understand each nuance and permutation that can create exponential results. "Discover 55+ tested website conversion strategies that you can apply right now to your new or existing website to skyrocket response and cash generation"
How to harness the compounding power of small changes across multiple variables to double, triple and even quadruple sales and enquiries without spending an extra cent on traffic generation or marketing. 80% of your success online comes from only 20% of your actions � I'll show you what those actions are so you can make your results even more dramatic and immediate! You'll get the cumulative results of years of detailed testing and tracking of specifically what you MUST do online� and� what NOT to do - saving you the hundreds of hours and thousands of dollars trying to figure it out yourself. How to separate the hype for reality about Internet marketing: a no-nonsense, no B.S. guide for business owners and professionals who want to learn how to use the Internet as a business-building asset. List building secrets of million-dollar enterprises. How to unleash the power of education-based marketing to gain notoriety and a strategic edge in your market. How to combine offline advertising with the power and reach of online marketing for even greater return on your advertising dollars. How to get Blogs, Adwords, other PPC search engines, SEO, Space Ads, Direct Mail, Telemarketing, Joint Ventures / Endorsed Mailings, Yellow Pages Online, and online PR to start pulling in traffic and sales for you. Tricks of the trade: small changes that have a huge effect on your bottom-line! The specific fonts, formats and colour choices that boost response - and what to avoid at all costs. The right way to use graphics on your website to increase sales and credibility. And many more tactics you can begin applying immediately to increase sales and enquiries for no extra marketing cost � over 55 in total! This concise new audio program called is called Search Engine Strategies, and it clearly lays-out exactly what you need to do in order to get higher search engine rankings– no-matter what business you’re in… and… no-matter how much or how little exposure you’ve had to Search Engine Optimisation. How search engines rank websites. To play the game you first need to understand the RULES. Don’t worry - you won’t have to read a hundred pages because the important points really aren’t that complex (though some people would like you to think they are). How to pick ‘huge revenue earner’ keywords for your business and stop optimising your site for irrelevant or unprofitable search phrases that will take your sales nowhere fast. Which key phrases are a waste of time and money, plus how to find keywords that are both higher converting and less competitive. Exactly how to structure folder and files to reinforce your rankings. Everything counts. Everything either helps your rankings or pushes them over a downward slope. Should you optimise all pages or few? Discover what works now. How picking the wrong web hosting service could be undercutting your rankings (cheaper is not always better). Forbidden things that many SEO experts recommend and how you could get banned by the search engines if you follow their advice. 3 little understood but profoundly simple techniques to strategically build incoming links and drive higher profits. A thorough but concise review of 11 of the most effective link building strategies. With so many choices you could scale back or even cancel your pay-per-click account and still be making more sales than you currently are. Marketing Results Managing Director Will Swayne is featured on the topic of website optimisation - turning clicks into cash using web analytics. This 4” Binder is the single repository of your Platinum Program experience so you can track your growth as you discovery new opportunities and test new strategies. This is a day-by-day record keeping system that keeps you on track and accountable to yourself. As you start to add to it, you’ll keep a growing sense of accomplishment and pride. It takes only minutes per month to keep updated, but at the end of the year, it becomes a priceless record of your growth lessons and accomplishments. This ground-breaking questionnaire takes you through a step-by-step self-analysis of your business vision and its implementation. An on-going work in progress, it supplements and complements the Business Building Blueprint™ to get you to focus on the levers that you can use to exponentially grow your business. The Business Mastery and Internet Mastery Platinum Programs are designed to create a MasterMind Group atmosphere that fully leverages the assets, skills, abilities and experience of all of their members. This massively powerful, unique program design is a world first. What is the MasterMind Principle, what makes it special and how does the concept fit in to the Platinum Program? The concept of the MasterMind Group was formally introduced by Napoleon Hill in the early 1900s. In his timeless classic "Think and Grow Rich", he was the first to summarise, consolidate and document the organising principles (distinctions of success) of the most powerful, influential and financially successful people of that era. Nearly every great achievement or massive fortune in history has been the product of a team of minds united in achieving the same, pre-defined goal. The American Declaration of Independence was the result of a MasterMind group, so was man's first powered flight, as well as man’s first flight into space and subsequently the moon. These ‘World First’ Platinum Programs are made available to the most ambitious business and internet entrepreneurs who wish to work one-on-one with me, Australia’s #1 Exponential Growth Strategist. They are not standard coaching programs, nor are they a collection of seminars, workshops and events. They are uniquely designed programs founded on Dr Napoleon Hill’s revolutionary MasterMind Group concept. An integral part of the Business Mastery and Internet Mastery Platinum Programs are the monthly workshops. During these monthly MasterMind sessions Platinum members have the opportunity to ask questions and get answers from the group in a MasterMind session format. Unique Selling Propositions (USPs) are an often misunderstood business tool. Learn what a USP is … and what it’s not. Develop your USP and learn how to leverage it as an exponential sales and marketing tool that will explode your profits as suspects and prospects begin to opt OUT of your business! How much money do you throw out the window each and every day? Learn how to reclaim your time (and money!) with these simple, yet incredibly effective time and gap management strategies. Just implementing ONE of them could save you up to an hour each and every day! How much of your business is generated by word of mouth? And how many referral systems do you have in place to ensure that your clients have an incentive to keep on spreading good word of mouth? This workshop will look at a variety of ways in which you can develop referral systems to ensure that clients continue to flow into your business with minimal effort on your part. Host-Beneficiary Partnerships are difficult to negotiate and even more difficult to successfully pull off. This workshop will show you how to develop HB and JV partnerships that pay! We’ll look at what a HB is, why most HB partnerships don’t work, the most important things you need to know before choosing a HB partner and how to structure HB partnerships for maximum return on your effort. What if you could read the minds of your suspects, prospects and clients and then use this information to sell directly to them? This workshop will introduce you to a range of tools that will allow you to do just that! These same tools can then be used as a recruitment and staff retention tool, to make sure that you easily attract (and keep!) the perfect team. Even if you have no plans to sell your business in the foreseeable future, you want to make sure that your business is Investor Ready™– because your business is only ever worth what someone will pay for it. This workshop will take you through what you need to know to create a business that is systemized, strong and Investor Ready™. Negotiation is one of the most important skills that entrepreneurs have in their arsenal. By learning how to negotiate exponentially, you’ll increase your ability to land win-win deals for you and your clients, putting more money in everyone’s pockets while reducing your costs. Pathways to Profits is a unique graphical way of looking at business that will enable you to optimise your results by quickly and easily identifying where your time, effort and costs can be minimised and your sales, revenues and profits maximised. This interactive tool helps to unlock the windfall opportunities that lie hidden in your business. This simple and elegant concept is a foundational element of the Platinum Program whereby you’ll be taught to identify and deploy your Next Best Step™ along your Pathways To Profits™. Knowing the specific growth levers that exist in your business is important to trigger and then maintain sustainable growth. The concept of managing metrics simply means tracking and tracing the components of production, sales and marketing that gauge progress in a measurable and relevant way. Platinum Members have access to over 300 online and offline metrics to select from to choose the ones that are most pertinent to their particular business, situation and context. Even though success leaves clues, it is often the case that as an entrepreneur, you have no idea what those clues actually are. This simple strategy uncovers what has worked for you in the past so that successful strategies and tactics can be replicated and repeated – over and over again. Imagine being able to re-create your successes easily and effortlessly – this template and methodology is an eye-opener for small business people who have been successful but might not know why. This reveals the key components of success that can then be replicated quickly and easily. These MasterMind Session calls are restricted to Platinum Members only. Gold, Silver and VIP Momentum Members get to listen to 12 pre-recorded calls, but you as a Platinum Member get to BE on the call so we can work on YOUR business, give YOU the breakthrough ideas so YOU get on the BRW Fast 100 list, double YOUR revenues, reduce your workweek by 10 hours and/or expand your marketplace from a local to a national business this year. A MasterMind Session is a unique experience that has to be experienced to be fully understood and appreciated. How to create massive value out of thin air and produce clients who are raving fans. Exponential strategies for overcoming common business challenges and obstacles. How to leverage your ‘unworthy’ assets to achieve YOUR ultimate outcome. How an exponential mindset creates and leverages “Cheat Sheets” to explode value into your business. How to take your Next Best Steps™ in your business - RIGHT NOW! How to discover, attract, and keep the most profitable clients to dominate your marketplace. Critical elements you MUST have in your referral systems to produce Rivers of Revenue™ for your business. Strategic planning to optimise and fuel your business for future success. Why you MUST listen to this before you even think about creating Joint Ventures, Host-Beneficiary Partnerships and Strategic Alliances. How to find those little things that make a BIG difference that are out-of-the-ordinary and create extra-ordinary results. Power of a “To-Do List” to get more out of everything you are doing. These exercises and assessments are cherry-picked for the current members to meet their on-going and timely requirements within their businesses. We exponentially leverage the resources within the Platinum MasterMind to resolve issues and dramatically improve results for each other. As a Platinum Member, you will receive an envelope every month with REAL LIFE samples and examples of Exponential Mindset Thinking™. Each item is accompanied by a short commentary on its exponential aspect or perspective. The Massive Momentum Monthly Mailing™ includes articles, ads, coupons, advertorials and other really cool stuff you just won’t find anywhere else. You will start to look forward to receiving it every month since no two mailings are even remotely alike. They are the VERY BEST EXAMPLES of what you can do when you know how to Twist the Kube™. BECAUSE the Massive Momentum Monthly Mailing™ is hard copy, the tactical nature of being able to see, hold and feel some of these samples is priceless. If you are a Business Mastery Platinum Member, the mailings are focused on Business Growth whereas Internet Mastery Platinum Members have their very own unique mailings that are 100% Internet related. This 3x4 foot fill-in-the-blanks blueprint is the cornerstone element of the Platinum Programs integrating all aspects of the Business Building concepts in one place, visually and can be updated on an on-going (usually monthly) basis. It’s revolutionary design allows you to have a SINGLE OVERALL VIEW of your business on one single sheet of paper – eliminating time consuming marketing plans, proposals and other time consuming documentation. Designed to be practical and easy, it accelerates your growth by keeping you focused on your Pathways To Profits™ so you apply Management By Metrics™on an on-going daily basis without interruption or distraction. This unique graphical way of looking at business enables a business owner to optimise results by quickly and easily identifying where time, effort and costs can be minimised and sales, revenues and profits maximised. This iterative and interactive tool helps to unlock windfall opportunities that lie hidden in every business. Knowing the specific growth levers that exist in your business is important to trigger and then maintain sustainable growth. This concept of managing metrics simply means tracking and tracing the components of production, sales and marketing that gauge progress in a measurable and relevant way. Platinum Members have over 300 online and offline metrics to select from to choose the ones that are most pertinent to their particular business, situation and context. Each session is private and confidential. One hour to discuss anything and everything. Members are able to record the session if they want - there will be THAT much information you'll want to capture and make your prisoner for life. One Member now knows that he/she can afford to offer his/her core service for FREE when BUNDLED with another revenue generating solution/service. That will automatically attract MORE clients that he/she can handle AND catapult cash flow sky-high within weeks and create an income stream in excess of $500,000/year. Someone figured out that he/she has special expertise that can be sold to BOTH sides of a situation DOUBLING the value created and increasing the potential revenue to a whopping $250,000 in 12 months, working less than 100 days in the entire year! It gets better - THIS expertise can be leveraged in more than a dozen of similar situations IN OTHER INDUSTRIES which means his/her annual potential income is practically UNLIMITED. A little more down to earth, another Platinum Entrepreneur now has 3 projects that can EACH double his/her income in the next 6 to 9 months by working 20 to 30 hours less per week. If you've done the maths, that means he/she can QUADRUPLE income by working the SAME number of hours. Ka-Ching. PLUS there is a licensing opportunity that can take him/her from an effort-based business to a value-based model by THIS Christmas... Fuelled by the Internet Mastery Platinum Program strategies NEXT year - the licensing revenue could surpass his/her total CURRENT income... Do you think that is compelling enough to STEP UP?!?! Another member can generate $500,000 to 1 Million of up-front cash flow (investment) to establish a global business model that ensures FREE employees for 12 months with an irresistible reward and risk reversal strategy that can be leveraged on the Internet within DAYS. A fifth member realised that he/she just needs to speak non-technical English to capture clients' imagination AND might even deploy a proof of concept to Platinum Members AT Advanced Business Mastery... That alone could put $100,000 in his/her pocket within the year IF he/she learns to speak in non-IT English, leveraging resources available WITHIN the Platinum Program. Not to be outdone, a seventh member now has at least 4 strategies that can be IMMEDIATELY put into action to finally put the walk into the talk about his/her next phase of growth. This new phase is SO valuable, he/she will probably give away a $1 Million/year revenue stream to someone else to focus on this next phase... It's THAT good. Can you imagine giving up that kind of revenue because you have something better to do?!?! Last, but not least, another is shifting his/her mindset to craft and create a business (model) for each one of his children. How friggin' cool is that?!?!? Matching each child's personality with a career/business/model that will enable the child to grow, expand and fully develop their most natural talent WITHOUT the burden of carrying on the family business... Now that juices me! Truly inspiring and amazing stuff - it really is. When the MasterMind erupts the results are unbelievable and it only gets better as everyone plays full-on and gives it their unqualified boundless energy and focus. “As a Business Coach I am always looking for opportunities to increase my knowledge in all aspects of business so that I can continually serve my clients at higher and higher standards. When I first heard Marc speak I was immediately impressed by his passion and knowledge and particularly how he can take that knowledge and apply it to such a wide range of business challenges whether they be for large corporations or small family enterprises. 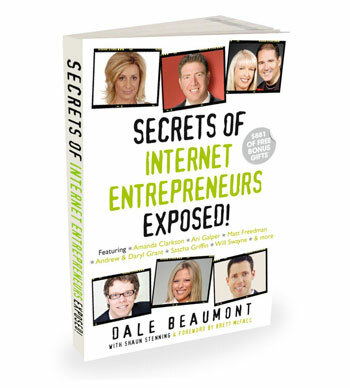 In Secrets Of Marketing Expert Exposed! you’ll discover how Australia’s #1 Exponential Growth strategist Dr Marc Dussault has achieved his extraordinary results on a shoestring small budget and in a fraction of the time you’d expect. Marc built his companies 3 times faster, with double the industry average sales per employee, with a fraction of the industry's employee attrition rate while consistently producing twice the profitability of his competitors – while he was doing his MBA and Ph.D. full-time and opening a second office in a distant city (Toronto), taking 4 international trips/vacations for a total of 8 weeks while also franchising and distributing his integrated printing software application in Europe! …And he did it in the printing industry – one of the most competitive, cut-throat, dynamic, low-margin industries! This unassuming book gives you The ‘unfair advantage’ the MEGA RICH secretly use as their secret-weapon to become MULTI-MILLIONNAIRES WITHOUT inheritance, luck OR money AND the SUPER SUCCESSFUL use to accomplish the seemingly IMPOSSIBLE. Every successful man or woman collaborates with other high achievers on an on-going, regular basis to fill, complement and supplement their knowledge gaps. It’s the secret of learning more in minutes and hours than most people learn in months and years. The ‘secret breakfast’ of champions! If you’ve ever wondered how people like Donald Trump, Bill Gates, Richard Branson and Steve Jobs got to be so rich and so successful, it’s because they developed a brain-trust or MasterMind they regularly leverage to whip the pants off the competition. They’re not necessarily smarter than you or me but they have access to and take advantage of the MasterMind principle on an ongoing basis while most people don’t even know what a MasterMind is. They DO what most people never get around to doing and so they produce results that most people can only dream of. Complete the Business and Internet Mastery Platinum Program curricula, including attending all the workshops and participating on scheduled conference calls. Maintain prompt payment terms with no defaults or delays and that payment in full is made prior to your claim. Meet all the terms and conditions of any agreements you have or may enter into with Exponential Programs over the guarantee period. You maintain a complete list of strategies deployed with accompanying metrics demonstrating the results obtained and submit it with your claim. Complete all the associated exercises, assignments and assessments in written, verbal or electronic form for each program’s curriculum. Keep and maintain full records of your investment and business activities including, but not limited to financial records. Give Exponential Programs consent to auditing your claims and records to validate your claim. Provide a copy of your booking form and proof of on-time payments with your claim. This guarantee is in addition to your existing rights and unless otherwise stated, expires 12 months following your program start date. Admission to the Platinum Program is not a confirmation of Exponential Programs’ to honour the double-your money-back guarantee. To be eligible for the guarantee, you must request admission within 30 days of your program start date. Exponnential Programs reserves the right to refuse the guarantee at its sole discretion. 80 percent of US families did not buy or read a book last year. 70 percent of US adults have not been in a bookstore in the last five years. If we have access to all of this wonderful information that we know can change our lives, how come we’re not happier, more successful, healthier and wealthier? Only 26 percent of people identify and focus on specific, tangible targets of what they want. Less than 15 percent of people wrote down their goals. Less than 12 percent of people surveyed said they regularly set a whole series of related daily, weekly and long-term goals, complete with starting times and completion dates. Only 11 percent of people put time aside to visualise the attainment of their goals on a consistent basis. So how is it possible that 74% of people are succeeding at getting what they want in their business and life if they don’t have ‘specific, tangible targets’? The easy answer is that they don’t. Sound like anyone you know? The Exponential Programs aren’t just about goal setting (although that’s certainly a component!). They are results orientated and focus on holding you accountable for achieving what you say you will. If you’ve ever played a competitive sport, you know that it has a lot in common with running a business. There’s the high of scoring the point (closing the deal), the low of defeat (losing the deal), the torture of training (the day-to-day grind) and the determination to make it, no matter what the cost. There’s also the common fact that those who are considered sporting champions have gotten that way via a long, hard road, paved with blood, sweat and tears and littered with the remains of those who didn’t work as hard, didn’t quite have the commitment or were just plain unlucky. The good news is that, just as for the sport champion, there’s a training regime you can consistently undertake in your business to ensure that you’re always in the major “premier” leagues. But in order to devise the right regime for you, you first need to know where you are now in each of these important business training areas. The 12 month Platinum Program takes you through these steps. Why the program is delivered over 12 months. Because these steps take time – just like the champion athlete, you need that time to get the full experience, to truly immerse yourself in the exponential mindset. You’ll frequently repeat what works by completing your Exercises and Assessments. Your immersion is ensured when you attend the range of events that are part of the program. The very act of attending all of these events (whether physically or by phone) raises the level of your peer group. You’ll be working with only the most committed, motivated, exponential entrepreneurs in the country. Imagine what having minds like these thinking about and working on your business could do for you! Accountability is paramount to the Platinum experience – you will no longer be left ‘on your own’ to figure stuff out – if you get around to it. Each month, you will have to deploy strategies IN YOUR BUSINESS, measure, track and report back to the group... Can you imagine what that will mean to your results? It’s like reading a book for fun and reading it to pass an exam – TWO TOTALLY DIFFERENT experiences and TWO TOTALLY DIFFERENT RESULTS. This accountability is especially important due to the guarantees on both programs. How can we offer such a powerful guarantee? Because you will have Australia’s #1 Exponential Growth Strategist working on your company for the next twelve months, using the most advanced business strategies and principles of the most successful people in the world in the areas of sales, marketing and personal development. We know the process works, if you apply it. The Business Mastery Platinum Program provides you with hands-on assistance AND the accountability you need to get results. NOBODY can make a similar promise. NOBODY even understands our game since it has never been done before. NOBODY has integrated the works of Anthony Robbins, Brian Tracy and Jay Abraham like Dr Marc Dussault has. Those guys are not overnight successes. They have been walloping success after success after success for over 30 years. Thirty years of making exponential results and setting the pace for the rest to follow. They set the lead continuously for the rest to catch up eventually… hopefully! What do you mean by ‘exponential’ mindset or ‘exponential’ marketing? ‘Exponential’ is a mathematical term that literally means “an increase becoming more and more rapid”. My definition of exponential, as it relates to you and your business, goes even further than that – it’s about creating momentum so that the increase in your mindset and your profits is not only more and more rapid, but also easier and easier. Just like a merry-go- round – the first “push” is the hardest, then you can just stand there and keep it spinning with only a little additional effort. Exponential marketing is the art and science of leveraging (often hidden) assets, opportunities and resources that lie within every organisation. It is about seeking creative and innovative ways, combinations, permutations and variations to extract, create, embellish or enhance substantial value for a multiplicity of benefactors (including buyers, sellers, suppliers, referrers, consumers and employees). Having a holistic mindset is an acquired skill that requires letting go of the status quo and thinking outside the square while keeping one’s feet solidly on the ground of commercial reality. Once you’ve acquired the exponential mindset, you never ever see business the same way again. Opportunities will pop out of the most surprising places – you’ll never run out of ideas. The biggest challenge will be selecting the best of all the great ideas to implement! You’ll agree that’s a pretty good place to be! Since exponential marketing is a mindset, it applies to start-ups just as well as it does for well-established companies. As a mindset, it is often difficult and sometimes impossible to change the prevailing existing mindset in large organisations that can’t readily embrace change. Therefore it is often the start-ups that embrace it and run away with it, whereas the larger organisations might not implement as much, but have massive scale on their side to counter balance their organisational inertia. This approach of having a laser-like focus on bottom-line results alone has transformed countless under-performing companies into cash cows almost overnight just by stopping what isn’t working and replacing those activities with cash-positive alternatives. But... it won’t happen unless you take a step forward and make a decision. Isn’t all this just for big businesses with huge advertising and marketing budgets and resources? Big businesses have what is called organisational inertia. Inertia is the predisposition to remain in the state you’re in. In the case of big bureaucratic corporations, it’s the ‘don’t rock the boat, this is how we’ve been doing things for 20 years syndrome’. Big businesses certainly have scale, resources and financial resources, but they often lack the entrepreneurial, innovative mindset to consider, explore and initiate strategies that go counter-culture. You can’t get extraordinary results doing ordinary things. Large corporations have challenges thinking outside the square, especially if they think they dominate or invented the square! All kinds of businesses benefit from the Platinum Program – especially those who are ready to take the ‘Next Best Step™’ – that is, businesses who want to make more money than they are making now, while working less and enjoying their life more! Did you know that 86% of Australian SME’s have no written marketing strategy or tactical implementation plan that they continuously apply and follow? A marketing strategy is just as (if not more) important for a small business as it is for a large corporation. All kinds of businesses benefit from the Platinum Program – especially those who are ready to take the ‘Next Best Step™” – that is, businesses who want to make more money than they are making now, while working less and enjoying their life more! Ready to make a whole lot of money! Disclaimer: The Business and Internet Mastery Platinum Programs are not for everyone. Due to the performance guarantees involved, Exponential Programs reserves the right to refuse anyone entry to the program at its sole and unilateral discretion without explanation or justification.